It’s been more than 10 years since we first introduced CallerID Trifecta for Asterisk® and the FreePBX® platform. A few months later it morphed into CallerID Superfecta and, as they say, the rest is history. 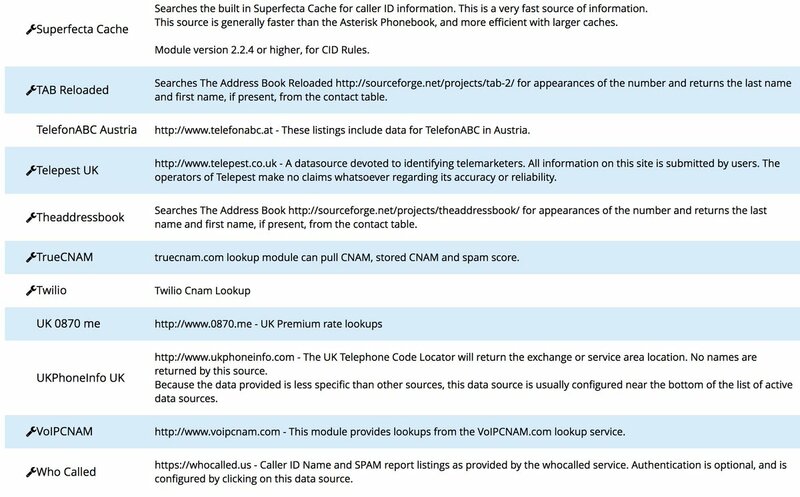 Today CallerID Superfecta is used by over a million people around the globe to obtain CallerID Name (CNAM) information from over 70 different lookup sources. WOW! Just call me the Proud Papa. What a journey it has been, and our special thanks to the dozens of contributors. Unfortunately, for those in the United States, most of the lookup sources now are commercial enterprises much like the original Bell Sisters that monopolized CallerID information by keeping it proprietary instead of forwarding CallerID Name data together with the CallerID number of incoming calls. In fact, for many users, the cost of CallerID lookups now is more expensive than the cost of the VoIP trunks carrying the calls. While we can’t solve the problem, we can make the cost of these CallerID lookup services considerably cheaper using a neat little trick with CallerID Superfecta. Here’s the problem. Many cell phone users don’t subscribe to any service that keeps track of the caller’s identity. The same is true for those using services such as Google Voice. When you receive a call from one of these users, the CNAM provided for the caller will either show something like "Mobile Phone User" or the city and state of the caller’s cellphone provider. This doesn’t keep the commercial CNAM providers from dinging you every time you receive one of these calls. And if your girlfriend calls you a hundred times a month, the commercial CNAM providers charge you for a hundred lookups even when the calls are from the same caller. That ends today. Once you implement this new CallerID add-on, you’ll only get billed for a single CNAM lookup regardless of how many times that person calls your PBX. Better yet, with a little effort, you can quickly replace the CNAM entries of the mystery cellphone and Google Voice callers by inserting their actual names into your Asterisk phonebook using either the FreePBX GUI or the Asterisk CLI. We’ll show you how. Here’s the trick. CallerID Superfecta lets you prioritize source lookups when incoming calls hit your PBX. For example, you can lookup the CallerID number in AsteriDex and the Asterisk Phonebook in a fraction of a second at no cost. Once there’s a match on the CallerID number of the caller, additional lookups stop. 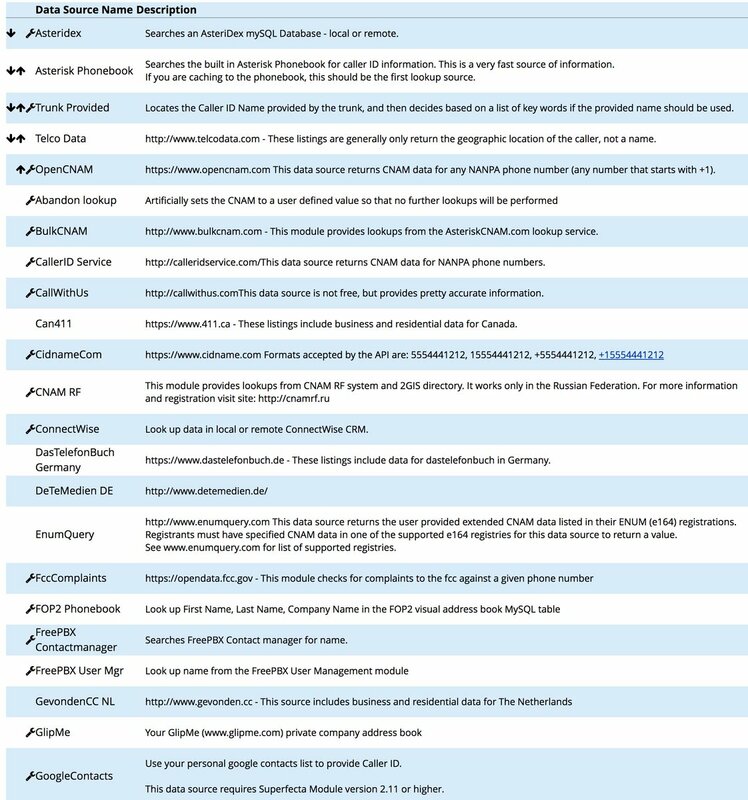 So what we want to do is prioritize the lookups so that the free sources are used before any commercial lookup service is triggered. For the commercial CNAM source in the U.S., we’re going to use OpenCNAM in our examples because their service is one of the easiest and least expensive to implement. All OpenCNAM lookup options are less than a half a cent per lookup. By placing OpenCNAM third in the Default Superfecta lookup sequence, it will only be used when there is no match in either AsteriDex or the Asterisk Phonebook. Getting Started. It would obviously be a hassle to have to add every caller to one of these phonebooks every time a call arrives on your PBX. So the other half of today’s magic is to automatically add an entry to the Asterisk Phonebook every time a call hits your PBX. Then, the next time you receive a call from that same number, CallerID Superfecta will be able to find it in your free databases instead of querying OpenCNAM for yet another commercial lookup. As a general rule, in the United States, phonebook data is not copyrightable. However, you should consult an attorney for questions regarding the legality of this methodology as it applies to any particular CNAM lookup service. We’re aware that CallerID Superfecta has had a caching option which provides similar functionality; however, users have reported mixed results and data corruption with that feature so we’ll be implementing a slightly different solution that relies on Asterisk’s extremely reliable SQLite3 database. This also provides the flexibility to customize the entries after completion of a call for more accurate CNAM information on subsequent calls. Unfortunately, a CNAM entry of ATLANTA, GA doesn’t tell you much about the caller even though you paid for the lookup. By inserting these call entries in the Asterisk Phonebook, you then have the option of easily customizing them in multiple ways. Not only will this provide better CNAM data on subsequent inbound calls, but the phonebook can also be used to make outgoing calls and to produce an alphabetized phonebook listing as well. sqlite3 astdb.sqlite3 "select key,value from astdb where key LIKE '%cidname/%' order by value"
Activating CallerID Superfecta. 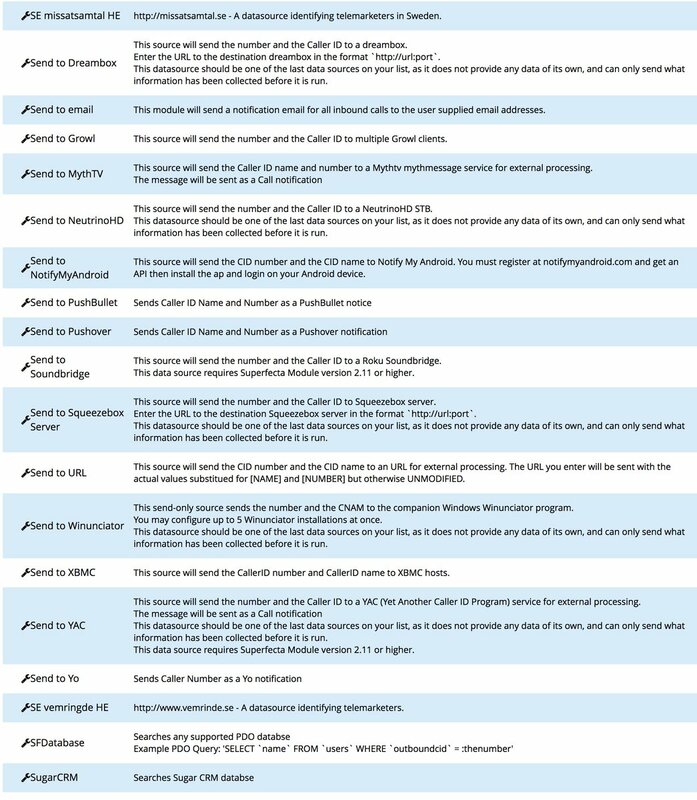 There are three steps in activating CallerID Superfecta. First, configure the Default Scheme for CallerID Superfecta in Admin:CID Superfecta using the settings we previously displayed. Use the Arrow keys to properly order the three lookup sources: AsteriDex, Asterisk Phonebook, and OpenCNAM. Be advised that there is a credentials mismatch in the Default setup for AsteriDex. To correct this, open the Default configuration for Superfecta and click on the Tool icon to the left of AsteriDex. The username must be root, and the password is passw0rd with a zero. Save your settings. Adding Hook for Inbound Call Processing. One of the decade-old shortcomings of FreePBX has always been the inability to insert dialplan code into the Inbound Call process without forever damaging your ability to add additional DIDs moving forward. While extensions_override_freepbx.conf lets you extract and manipulate large chunks of FreePBX code, the drawback is that once you do that, the flexibility provided by the GUI goes up in smoke unless you remember to always move the newly generated dialplan code back into the override context. 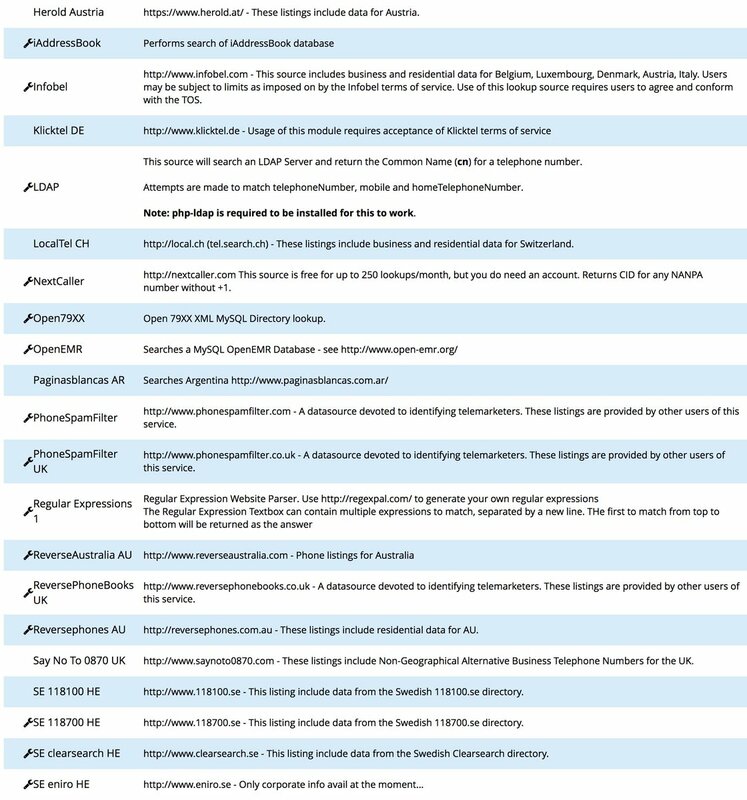 mysql -u root -ppassw0rd asterisk -e "UPDATE notifications SET candelete =  '1' WHERE  true;"
mysql -u root -ppassw0rd asterisk -e "DELETE FROM notifications WHERE true;"
Managing Your Asterisk Phonebook. 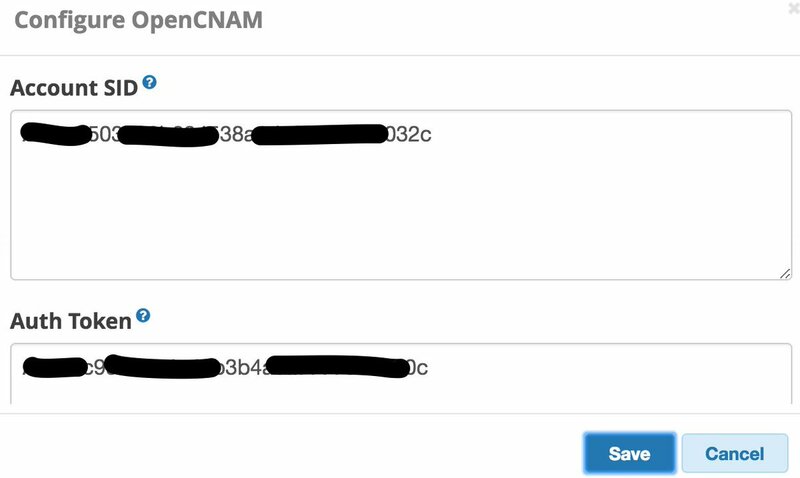 As we mentioned, there are a couple of ways to display and/or update entries in your Asterisk Phonebook that have been populated with OpenCNAM lookups. From the Asterisk CLI, you can display entries like this: database show cidname. database put cidname 8431234567 "Mundy, Ward"
The simplest method to manage your Asterisk Phonebook is from within the FreePBX GUI. Simply navigate to Admin:Asterisk Phonebook. There you can edit individual entries and replace generic CNAM entries such as Atlanta, GA within something more descriptive of the caller’d identity. You also have the ability to export the data and even create speed dial entries for frequently called parties. Once Speed Dial numbers have been created, you can reach the party from any phone connected to your PBX by dialing *0 plus the speed dial number. Finally, you need to complete some additional steps to implement the Spam Call Blocker as documented in this tutorial. Enjoy! This week I setup a new VULTR server using the 13-13 iso from January, all works great except the Superfecta module; the PIAF dashboard errors went away after upgrading the Superfecta module also. I updated with a newer version of it from Github and it stopped complaining, but also stopped resolving CID sources; bummer. I tested OpenCNAM and Gevonden.cc and the Superfecta logged complained about not being able to resolve those IPs. What finally resolved that issue was doing a simple ping, (which also failed), but revealed the desirable IP address. So I manually entered the DNS CNAME with the desirable IP address in /etc/hosts and life is good.